Since the days of Charles Finney pastors have engaged in the following sort of discussions – I certainly have. “If you want revival then you need to hold a revival.” “What do you mean by hold a revival?” “Well, advertise that you will be holding meetings every night for twenty-one days. Get in a top class evangelist from overseas. Hire a group of professional musicians for the duration. Things like that.” If you study how many of the recent ‘revivals’ started, you will find something very similar to this method. But is this God’s way? I don’t think it is. The great revivals of modern history were characterised by spontaneity and divine initiation. Men and women didn’t decide to ‘hold a revival’; God decided to revive His church according to His methods and His timetable. In my previous blog post I wrote of David’s Tent as a type of the church and I made the point that revival of the presence of God must be accompanied by a restoration of truth and a reformation of structure. The biblical history of David’s Tent is fascinating. Originally, the Ark of the Covenant, representing the presence of God, was in the Holy of Holies within the Tabernacle. The structure of this mobile temple was quite complex. There were three areas: an outer court, an inner court called the Holy Place and a restricted area called the Holy of Holies. The outer court contained the brazen alter of sacrifice and the laver of water. These stand as types of salvation through the atonement of Jesus Christ, and water baptism as the initiatory rite of the church. The inner court contained the Table of Shewbread, The Golden Minora, and the Incense Altar. These stood as types for communion with God and each other, the Word of God, and Prayer and Worship. Behind a thick curtain, in the Holy of Holies, stood the Ark of the Covenant as a type of the presence of God. One day, when the Canaanites were at war with the Israelites, and winning, the people of God rashly decided to carry the Ark of the Covenant into battle with them. They hoped that the enemy would flee when they saw the Ark, but instead they captured it and drove the Israelites back. From that day on the Tabernacle was without the Ark of the Covenant. It had the structure, the form, and the contents but it lacked the one vital element, the presence of God. What a picture of religion – rites, rituals and regulations but no presence of God! Sometime later the Canaanites returned the Ark and David gave instructions that it should be brought up to Jerusalem. 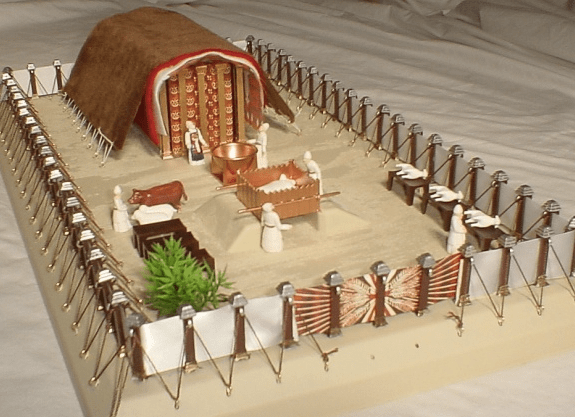 However, the Tabernacle was someplace else, and so David built a tent to house the Ark – the Tent of David. By all accounts this was a very simple structure with the sole purpose of providing a place for the presence of God. This to me is a type of the sort of structure we should have in times of revival – simple, uncomplicated and dedicated solely to providing a place for the glorious presence of God. Instead of setting up endless meetings, importing preachers and laying on professional musicians, we should be getting out of the way and keeping it simple. What do you think? I would love to hear your views so please post a comment or two on the blog.